To grow marijuana indoors above all you need marijuana grow lights. Your grow light is going to be your key piece of equipment. Because indoors your marijuana plants won’t have access to the sun. So you have to replace it somehow. This guide will explain everything you need to know about doing exactly that with marijuana grow lights. 1 Why Use Marijuana Grow Lights? Why Use Marijuana Grow Lights? The sun tells plants how and when to grow. It also literally feeds them through photosynthesis. Growing indoors, you have to provide that information and nutrition artificially. Your key job, then, as an indoor grower is to replace and mimic the sun. Fortunately, all manner of different grow lights are available for indoor growing to achieve exactly that. But not all plants need the same light. So marijuana grow lights are calibrated to the specific needs of marijuana plants. Marijuana is light hungry. It needs powerful lights. Moreover, different strains of marijuana have different light requirements. So before buying marijuana grow lights, you have to do your research. Unfortunately, for beginners, the whole area of grow lighting can be highly confusing. Not only are there many different types, brands and models of grow lights available, there’s also no shortage of advice—what’s worse, some of it conflicting. So in this beginners’ guide we’re going to run through the three main types of marijuana grow lights (fluorescent, HID or HPS, and LED) and their respective pros and cons. We’ll explain how plants use and respond to light. We’ll also show you what you need to know and look out for when buying a marijuana grow light. And finally we’ll point you in the direction of the best options for a beginner. Fluorescent grow lights are available in all sorts of shapes and sizes. From fluorescent tubes (T5s) to twisty CFL bulbs. CFL stands for Compact Fluorescent Lighting. As the name suggests, CFL grow lights can be great for growing in small spaces. The bulbs are relatively cool and the light less intense than some other grow lights, so they can hang quite close to the plants. Even very close, CFLs won’t overheat them or give them “light burn”. 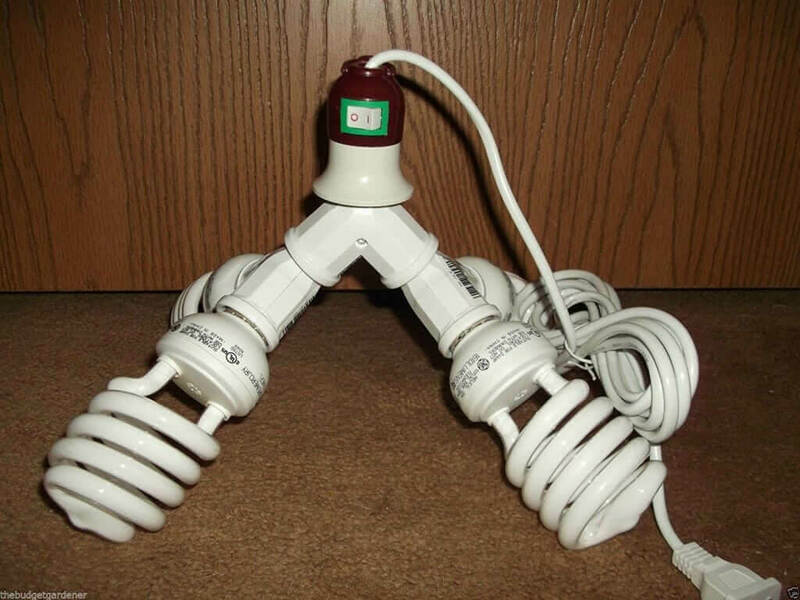 CFL bulbs are also cheap and easily available. They’ll fit all kinds of different light fixtures. And they’re pretty cheap in terms of electricity used too. You can also find CFLs in various different color temperatures. The warmer, more red bulbs are better for the flowering stage. While “daylight” bulbs are bluer and better for the vegetative stage. If you only want to grow one plant, you have a tiny space for growing, or you fancy trying out growing with a minimum level of investment, CFLs can be a great way to go. Also, consider them for “stealth growing”, where you’re looking to grow as unobtrusively as possible. Being able to have small bulbs close to your plants is a great advantage for these kind of grows. In fact, because fluorescent lights aren’t as intense as other marijuana grow lights, they actually need to be positioned close. Fluorescent light doesn’t penetrate as far down. So if you’re using CFLs for your grow space, you need to have a number of bulbs, positioned closely and strategically, to make sure your whole plant is getting plenty of light from them. You can hang them close to plants. Good for small or short grow spaces. Bulbs fit in all kinds of light fixtures. Good for clones, seedlings and young plants (you would have to hang warmer, brighter marijuana grow lights further away to give the same light as close CFLs, thus wasting a lot of electricity). Cheap option for a first trial grow. Good for a single plant grow. Can be useful supplementing other more powerful lights. Not much extra ventilation needed. Not good for large grows (if you want to harvest more than a few ounces, for instance). Relatively low yield per watt, if used for whole grow cycle. Need to check on your plants and light placement daily. You’ll have to learn how to train your plants to keep them growing low and flat (because fluorescent light doesn’t penetrate far). Not as energy efficient as some other marijuana grow lights. Not as long lasting as LEDs. Other marijuana grow lights give better control of color spectrum emitted. Other lights are brighter, more powerful. Many other lights more easily and accurately mimic sunlight. T5 grow lights (the T stands for tube, the 5 = ⅝-inch diameter) are easily available in garden and home improvement or DIY stores. In fact, you can use them to grow all kinds of different plants. These are a much bulkier option than CFLs. But given their size, better for larger grows. You’ll usually find them in longer, wider panels of multiple tubes. Like their smaller CFL counterparts, though, they run pretty cool, so you can still hang them quite close to your plants without harming them. And indeed they should be hung close—usually within about 4 inches. While fluorescent light is predominantly blue, you can get T5s in different color temperatures to optimize your setup for different stages of marijuana growth. Less flexibility over fixtures than CFLs. Need to add extra “bloom” lights with a redder output for the flowering stage, to supplement the main cool blue tubes. Still need to train plants, to allow for the closer proximity and lower penetration of T5 lights. With larger lights and larger grow space, the watts soon start to add up. You’ll find fluorescent lights are at their most efficient and cost effective for smaller grows. High Intensity Discharge (HID) marijuana grow lights are more efficient than fluorescent lights, but also run much hotter. They are still (probably) the most common grow lighting used for cannabis, although LEDs are catching up fast. HIDs are usually large oddly shaped bulbs that come in one of two varieties, Metal Halide (MH) and High Pressure Sodium (HPS). You’ll also see ceramic metal halide and Light Emitting Ceramics (LEC) bulbs, which are two names for the same thing, a bulb that’s a sort of mix of MH and HPS technology. More specifically, LEC bulbs are a type of MH bulb that use ceramics as a part of the bulb, just as HPS bulbs do. But let’s go back a bit and explain the differences between MH and HPS. Metal halide bulbs emit a bluish light and are often used for the vegetative stage of growing. HPS grow lights, on the other hand, are often added during flowering, as they give a yellower light that encourages bud production and are even more efficient than MH lights. However, most weed growers use a combination of the two. According to some, an HID setup gets better yield per watt than any other kind of grow light. However, others would argue that good LEDs used correctly are on a par. 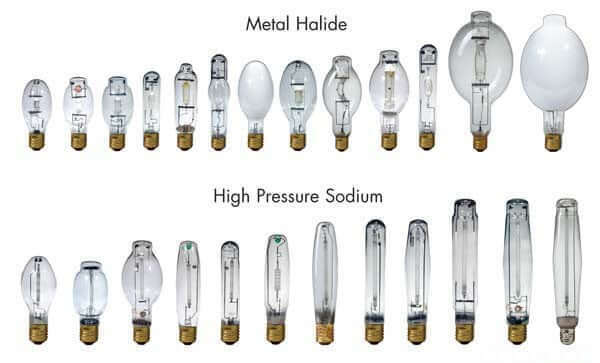 All these kinds of bulb (HPS, MH, LEC) are HID bulbs. As the name suggests, the light they discharge is of a much higher intensity than fluorescent grow lights. However, there are trade offs. Not just the heat and the extra cooling required to deal with it, but also the extra parts you’ll need compared to LEDs or fluorescents. More components = more things to wear out, go wrong or be mismatched. Some claim that HPS lights used in the flowering stage are the most efficient marijuana grow lights available in terms of yield per watt. HPS lights are excellent for flowering, and very efficient. Simple to use, no guesswork when trying to hang them at the right distance from the plant. Have been used effectively by growers for many years, so plenty of advice available. This also means the HID lights are more standardized than the newer LED grow light technology. More parts to go wrong. Have to set up exhaust and ducting. Extra cost of running the exhaust and cooling system. You’ll need to replace MH bulbs about once a year (assuming 2-3 grows). HPS bulbs last around 2 years (4-5 grows). Relatively short lifespan of bulbs. More parts in general required, compared to other lighting types: external ballast (to mediate electrical current), extra cable, reflector or hood that houses the bulbs, all in addition to the aforementioned cooling and exhaust. Ballast can need replacing too, after around 20,000 hours of use. Have to hang this kind of marijuana grow lights high above plants, so need a tall grow space. Relatively high power requirements and running costs—especially compared to LEDs. LED (Light Emitting Diode) is the newest marijuana grow light technology on the block, relatively speaking. These days it’s firmly established as one of the most credible options around though—and still constantly improving. Rather than using bulbs, arrangements of diodes or chips create the light. These chips are extremely bright and can penetrate further than other marijuana grow lights to easily nourish the whole plant. Usually they produce the full spectrum of light needed by plants, meaning you can use them for the entire grow cycle of your marijuana plants. Which along with the ease and simplicity of setting them up makes them an excellent choice for inexperienced weed growers. While LEDs do run colder than other marijuana grow lights, put a lot of LEDs close together and they’ll still need some cooling. However, most growers won’t need any external fans to deal with this small amount of heat. Some LED grow lights are cleverly designed to dissipate heat without extra assistance. While many others have fans built in to direct any heat away from plants. 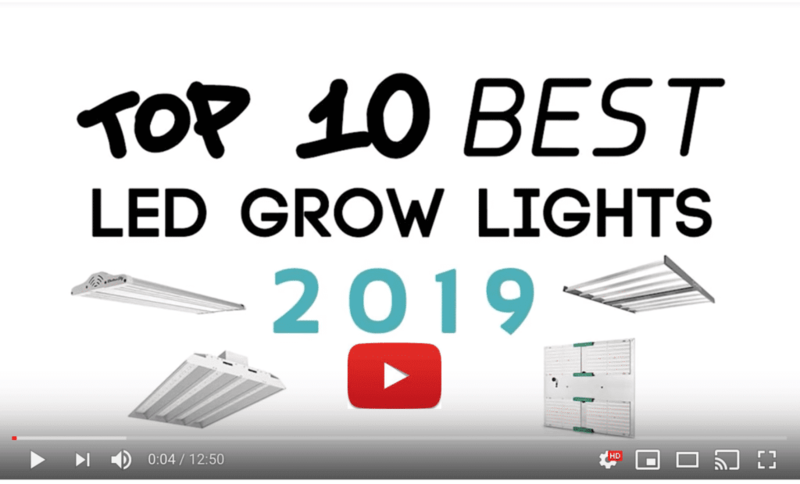 LED grow lights are arguably the simplest and most versatile lights to grow with, but there are so many models available now from so many different manufacturers that it can be difficult to choose. Later in this article we’ll give you some tips to help you find the one that’s right for you. Most energy efficient type of marijuana grow lights available—more brightness per watt consumed. LED light can penetrate further than other marijuana grow lights, to more easily reach and nourish the lower parts of your plants. Less risk of heat damage to your plants. Lower running costs, as use far fewer watts compared to equivalent brightness HID lights. Long lifespan—LEDs can last 50,000 to 100,000 hours. No extra parts required, just plug in the light and hang it up straight out of the box. Waste no energy producing light in wavelengths that the plant can’t use. Some growers believe LEDs produce more potent and resinous buds, particularly grow lights with UV-B light as part of their spectrum. You can usually use one light for the whole grow, altering its height for different grow stages (many also have different settings for flowering and veg). Can also be very effective when used to supplement HID lighting. Usually quieter than HID setups, due to fewer and smaller fans running and little need for extra ventilation. Little industry standardization, meaning it can be hard to compare lights and ensure you’re getting a good one (see below for tips!). Larger LED grow lights will still need some cooling. It can take some experience and experimentation before you get as high or higher yield per watt as you can get with HID lights. You still need a fairly tall grow space. Many LED grow lights recommend hanging at 24” until being lowered for flowering. Because LEDs are so bright, you need to be careful not to hang them too close to the plants—even a light hungry plant like cannabis can have too much light. PLEASE NOTE: Because LED marijuana grow lights are so simple to set up and use, can often be used for an entire grow cycle and work out cheaper in the long term with little or no loss of quality (arguably they can even raise bud quality and yield), we’re going to focus the rest of this beginners’ guide on LED grow lights. In short, they’re an excellent option for anybody, but for the beginner in particular LED grow lights are the most flexible and most forgiving option. And not only are they great for your first growing efforts, they’ll still be valuable to you later. Indeed, with extra experience you’ll get even better results from them. So you’re not going to outgrow them. Cast your mind back to high school science classes and you’ll probably remember a little something about photosynthesis, the process by which plants turn light into fuel for growing. But not only do plants feed on light they also respond to it in different ways. And react differently to the different colors or wavelengths of light present within sunlight. First things first, the colors of light that are visible to us don’t 100% correspond with the spectrum of light that plants use and respond to. So when you see the lumens boasted by marijuana grow lights, this measurement really only tells you how bright the light will appear to a human. What’s important to a plant is PAR, Photosynthetically Active Radiation—the wavelengths of light that a plant can use for photosynthesis. PAR is the wavelengths between 400 and 700 nanometers. The intensity of this light is measured in μmol/m2/s (micromoles per second per square meter) which is essentially the quantity of usable light falling onto a square meter of the plant per second. For a light hungry crop like cannabis, the more the better (up to about 800 μmol/m2/s, above which you risk damaging the plant). However, while plants don’t use light outside this range to photosynthesize, they do respond to it. As such, you can use those wavelengths to train your plants and cause them to react in beneficial ways. For this reason you will find that most LED marijuana grow lights offer ultraviolet and infrared in their full spectrum offerings, in addition to the wavelengths within the PAR range. More explanation of PAR and PPFD can be found here. 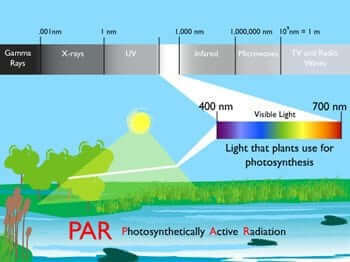 Ultraviolet is harmful both to humans and to plants. However, plants are able to protect themselves to some extent by producing what amounts to their own sunscreen. In cannabis plants this “sunscreen” is in fact THC-rich resin. Which is why manufacturers often include UV-B in the spectrum produced by their marijuana grow lights. A little UV-B exposure not only increases potency but the extra resin also helps protect the plants from pests and diseases. The ratio of infrared light to other red light gives clues to plants about how they should grow. A bit more infrared than normal, for instance, and the plant will think it is overshadowed and needs to grow taller to get more light. Infrared light is also helpful for the light schedules you set to simulate day and night and the changing of the seasons. Long days (18 hours) give your marijuana plants the illusion of summer. Switching to shorter days (12 hours) causes the plant to believe winter is coming and that it’s time to flower. Infrared is important here because it’s the last light a plant will sense at dusk and the first at dawn. Having some infrared emitted by your grow light, therefore, helps cannabis set its internal clock and react promptly to day and night. Without the infrared it will take the plant an extra hour or two to react to day and night, which on a daily basis all adds up to longer growing and flowering times and wasted electricity. We mentioned that plants seeing a lot of infrared think they are overshadowed so grow taller. Plants seeing a lot of blue, on the other hand, think they’re getting plenty of daylight so grow short and sturdy, spreading out. This is very helpful for the vegetative stage, especially when growing indoors where the height of your grow space might be limited. It also helps ensure the plants are getting plenty of light as more of each of them is exposed to that light when growing short and spread out, and the available light doesn’t have to penetrate so far. Yellows, oranges and especially plenty of red light are known to help cannabis plants transition to flowering and maximize the yield of bud. A lot of growers add extra red at the flowering stage. Some LED marijuana grow lights have a setting that allows you to do this very easily. Others have a full spectrum rich in red and blue that can be used for an entire grow cycle. While you might remember from high school science classes that plants are green because they reflect green light, they don’t actually reflect all of it. In fact, green light can penetrate further into cannabis leaves and further below the canopy than other wavelengths, making it important to photosynthesis and efficiently nourishing the entirety of your crop. When picking marijuana grow lights, make sure your chosen light has at least a little green in the spectrum. Early LED marijuana grow lights focused heavily on red and blue light, to the exclusion of other wavelengths. However, modern LED lights usually provide the full spectrum. When you’re choosing one make sure to verify that this is the case. Don’t be fooled by wattage. When it comes to LED grow light specifications this is one of the most confusing areas. Firstly, wattage is not a measure of brightness, only of how much electricity a light draws at the wall. This isn’t just true of LED lights. However, it is often quoted as if it’s a measure of brightness. Secondly, an LED grow light’s quoted wattage might refer to either one of two things (this has yet to be standardized across the industry). 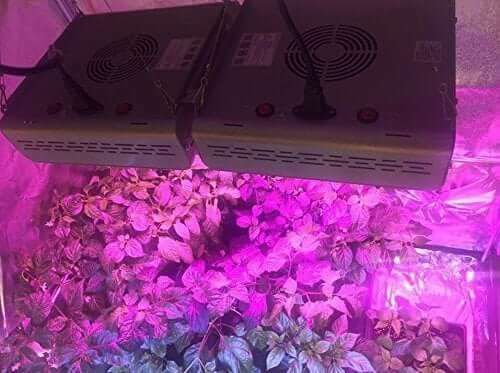 For instance, a 300W LED grow light could be either one that draws 300W at the wall or one that is equivalent in brightness to a 300W HID grow light. Because LEDs are more energy efficient than HIDs, the latter “300W” LED light will likely only draw around 185W to generate the same brightness as a 300W HID. So pay attention to exactly what is meant by an LED grow light’s stated wattage, and use it only to judge how much your electricity bills will be. Pay attention to what LED chips are being used. You’ll see 10W chips and higher, and some of these are pretty good. However, 5W chips are currently the most mature technology and will provide as much brightness and intensity as you’ll need. With the right lenses and reflectors some of these are actually more intense than some 10W chips. LED chip brand is important too. CREE, Epistar, Bridgelux and Osram are reliable names for marijuana grow lights. CREE LEDs are especially sought after. The best LED marijuana grow lights will have reflectors and/or optical lenses to properly focus and intensify light from the diodes. Cheaper lights without these can still be pretty good, but the former should give your plants a brighter more even light coverage. If the grow light has an internal fan, check how many hours it’s rated for. It should last at least as many hours as the LED chips (usually 50,000 to 100,000 hours). If the light is designed to dissipate heat without a fan, all the better. One less moving part to go wrong. Again, this tends to be a feature of more expensive lights. Another thing you’ll usually pay extra for is different grow settings. For instance, the ability to dim the light or change its color temperature for different grow stages. Which helps you to maximize yield and minimize energy used. Some top end lights are even programmable, often via WiFi and a smartphone app, to mimic the sun even more closely (for example, the Cirrus Titan 5 below). We’ve even seen some that go so far as to ensure that not only is infrared light in their spectrum but that it’s also the last light the plants see at night and the first when the lights come back on. Always check PAR diagrams! If the diagram only shows PPFD for the center of the grow space, be on your guard. If they haven’t given the PAR values across the light’s whole footprint, it may be that the light coverage is not very even. Unscrupulous, fast buck manufacturers often quote brightness very selectively. In fact, the more specifications provided the better. Period. It’s usually a sign of a more trustworthy, better quality manufacturer with nothing to hide. Likewise, a long warranty is another good sign. A five year warranty is outstanding, three is great, two is fairly common. Some manufacturers will give you specs for ratio of light to energy, or in other words efficiency. A measure of 1.5μmol per joule of energy or higher is great. With some of the top marijuana grow lights coming in at around 2.3μmol/j. Ideally, make sure you know what sorts of marijuana strains you want to grow before buying your light. Different strains have different optimal light requirements, so you’ll want to be sure that you’re getting a light that can give them what they need across your whole grow area. What driver does the light have? A constant-current driver (rather than constant-voltage) will extend the life of the diodes. Most marijuana grow lights should have a constant-current driver these days, but check and make sure. That’s a lot of things to consider, we know. But we can simplify it for you. Don’t worry too much about the exact spectrum of your grow light. What matters most for cannabis plants is how much light they’re getting. But in general a bright light with plenty of blue and red will perform better than a dimmer light with a fuller spectrum. So, first and foremost, look for brightness (remember: PAR/PPFD, not lumens or wattage). The brighter the better. Also make sure it gives good even coverage. Then, look at the spectrum. And if you’re still faced with a choice between similar marijuana grow lights, or money is tight, check what wattage the light will draw and go with the one that will keep your utility bills down. That’s as simple as we can make it. However, if you can afford it, spending a little extra is usually worth it with LED marijuana grow lights. While there are some bargains around, mostly you tend to get what you pay for. Best is very subjective, of course… but also very simple. The best LED marijuana grow light is the one that’s best for you. The one that best meets your growing needs and growing style. If you’re someone who likes to experiment and optimize, you’ll want a light with plenty of features and programmability. If you want to keep things simple, a good, no-frills, full spectrum light that you can use for the whole grow cycle will be best. Or if you’re on a budget, you’ll likely want one that gives you plenty of brightness for the power it uses. So we’ll end this guide by recommending three different LED marijuana grow lights for three different scenarios. If we were starting out growing and money was no obstacle, we would very probably choose the NextLight Mini. The NextLight Mini is the perfect full spectrum, full grow cycle light for a small grow space. It’s easy to use, versatile and everything about it is top quality. The little sister of the equally excellent NextLight Mega, its array of super bright American made LEDs will comfortably cover 2 x 2 ft for flowering and 3 x 3 ft during the veg stage. As well as being super bright, coverage is nice and even too. Just check out the coverage chart below. As you’d expect, it runs cool. But more than that, clever design means it can dissipate heat without any extra moving parts. So it shouldn’t cost you anything extra in ventilation, even in a grow tent. And there’s no fan to potentially go wrong. Of course, even if you have plenty of money to spend on a light up-front, you don’t necessarily want to keep shelling out. Fortunately, the NextLight Mini is very economical, drawing only 150W at the wall while being able to replace a 400W HPS grow light. In fact, it will more than replace an HPS light. Its spectrum is a closer match for the sun and it runs around 50% cheaper and up to 75% cooler. With a lifespan rated at 100,000 hours (15 to 20 years), it’s not going to need replacing anytime soon. A promise of long life that comes backed up by a 5 year warranty and some of the best safety testing and certification in the marijuana grow lights industry. Underwriters Laboratories Inc approve this light for both dry and damp conditions. In short, the NextLight Mini is commercial grow quality equipment you can use in a home grow setup. And although we’ve listed this as our ‘money no obstacle’ option, in reality the super-low running costs make it an excellent option for any grower who can afford the upfront cost. What we’re looking at for this scenario is a grow light that’s under $500 but with plenty of brightness for your buck. Something suitable for a beginner, but with a few higher end features. A light that you’ll be able to use easily immediately but get even better results from after a bit of experience. The Unit Farm UFO-80 Full Spectrum LED Grow Light. Drawing just 170W at the wall, this grow light’s top quality CREE and Osram LED chips and unique reflector system can cover a grow area of 2.4’ x 2.9’ for flowering and 4.6’ x 5.2’ for veg with intense, even, full spectrum light. You get veg and flower switches to give you a little extra control over your reds and blues at the respective grow stages. Being able to turn down the reds during vegging also helps you save even more money on energy. As for the manufacturer, Unit Farm has plenty of experience in making, designing and selling marijuana grow lights. You’re getting a reliable light with a pedigree. And with a lifespan of 50,000 hours the UFO-80 should last you around 10 years. A great blend of coverage, intensity, high end quality (CREE and Osram chips), efficiency and reliability. Plus a respectable 3 year warranty. All for a very affordable price. One of the best mid-price options around. Here we were looking for something simple but flexible, from a super-reliable manufacturer, that won’t break the bank. No frills. But does what it does cheaply and efficiently. A full spectrum light that will serve you for a full grow cycle, give your plants powerful, evenly spread light coverage and keep your utility bills low. 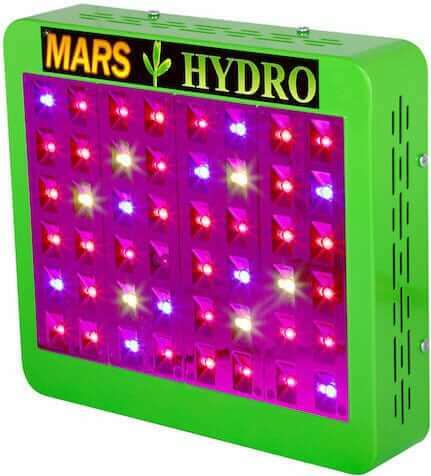 The Mars Hydro Pro II Epistar 80. 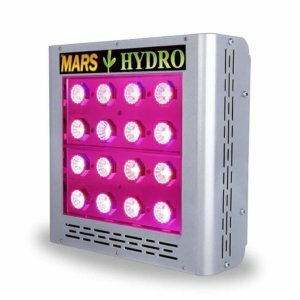 Mars Hydro has a great reputation for quality marijuana grow lights at low prices. The Pro II Epistar 80 is no exception. With this excellent budget grow light you can veg an area of 30” x 30” or cover 18” x 18” during flowering. The unit itself is pretty compact too, making it excellent for small grow spaces. The light comes with two switches. With only the grow switch on it draws just 81W, or 170W when the bloom switch is added for extra reds. However, the main area where this light exceeds similarly priced models is with the addition of reflector cups around the diodes to focus, direct and intensify the light, achieving greater penetration, better coverage and minimizing light loss. 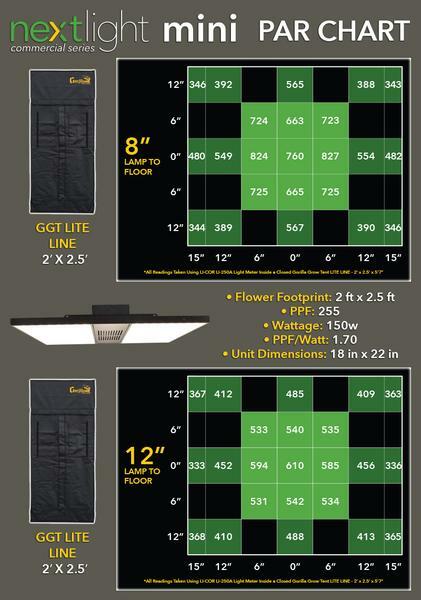 Like many marijuana grow lights in this price bracket it will last you around 50,000 hours. It also has a 2 year warranty, with a 30-day return. And should things go wrong you can contact a service center in California that responds within 8 working hours. While you generally get what you pay for with LED grow lights, this is one of those rare exceptions where you get that little bit of extra quality for your dollar. And unlike some budget manufacturers you can trust Mars Hydro’s specs. No exaggerated PAR values here. Hopefully now you’re a bit less confused about marijuana grow lights. And perhaps you’ve even settled on the one you’re going to start growing with or upgrade to. You can find reviews of more LED marijuana grow lights on our home page. If you’d like to know more about growing, we have a beginner’s guide. And we also take you through setting up a grow area.